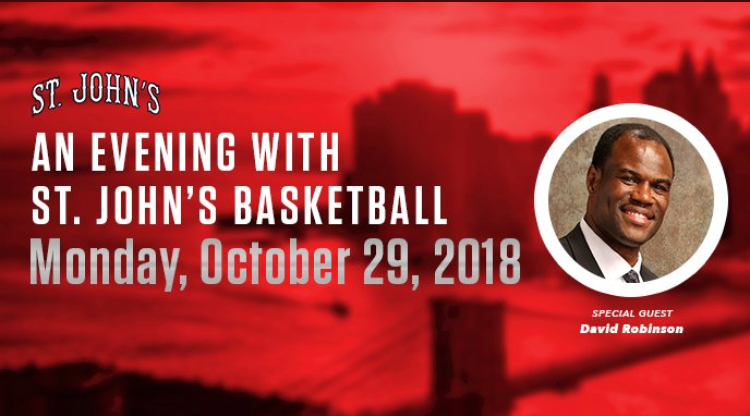 As the 2018-19 season is upon us, St. John’s has announced that its annual An Evening with St. John’s Basketball dinner will be held on Monday, October 29 at The Metropolitan Club. David Robinson, the who became an NBA legend with the San Antonio Spurs, will serve as the event’s honored guest. This continues the tradition of St. John's honoring a number of Naismith Hall of Fame inductees over the past several years. The first overall pick in the 1987 NBA Draft out of the United States Naval Academy, “The Admiral” was a two-time Olympic Gold Medalist and a teammate of Red Storm Head Coach Chris Mullin on The Dream Team in 1992. Widely considered one of the best centers to ever play the game, Robinson won two NBA Championships and garnered all-star recognition 10 times during his 14-year professional career. In 1995, Robinson received the league’s highest individual honor, taking home the hardware as the NBA’s Most Valuable Player. Over the course of his career, Robinson averaged 21.1 points, 10.6 rebounds and 3.0 blocks per game. A two-time All-American while in Annapolis, Robinson was a consensus First Team All-American and the winner of the Wooden Award as the nation’s top player in 1987, immediately succeeding a pair of Johnnies in Mullin (1985) and Walter Berry (1986). Following graduation, Robinson fulfilled a two-year service obligation in the Navy before beginning his NBA career in San Antonio. 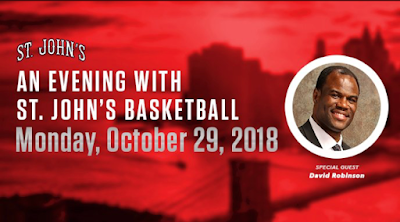 In addition to Robinson, St. John’ will also welcome beloved basketball personality Bill Raftery, who coached Seton hall during the early years of the Big East before settling into a long and prosperous career as a broadcaster. Currently, Raftery comprises one half of the marquee duo on FOX’s BIG EAST Basketball coverage and has called several Final Fours on CBS. The event will be held at The Metropolitan Club at 1 E. 60th Street and will begin with a cocktail reception at 6 p.m. The formal dinner program will begin an hour later at 7 p.m. Individual tickets can be purchased for $1,000, while whole tables are available for $10,000. For more information, contact Mary Pat Beirne ‘81C, ‘85GEd at 718-990-1873 or via email at beirnem@stjohns.edu .